ArtsMad is a visual presentation evening that takes place four times a year, where people from the wider arts community talk about what they do alongside a rolling show reel of interesting images. 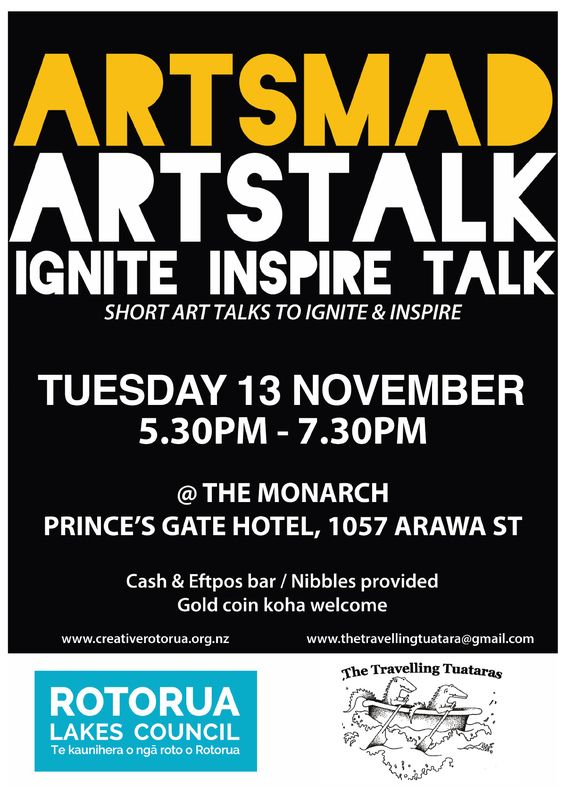 The evening takes place at The Monarch Room at Prince’s Gate Hotel and explores all areas of the arts… and more. You will hear passionate and inspirational talks from members of our community delivering a veritable roller-coaster rise on a variety of topics. Featuring up to eight speakers who each have 20 images and only 6 minutes to present them. It’s guaranteed to be a fast-paced, engaging experience! It is a great opportunity to get together with others who are passionate about a creative and vibrant Rotorua, and to connect about creative happenings in this event for all ages. Entry is a gold coin koha. Nibbles are provided with cash bar available.